Clipless pedals on a road bike can be scary in the beginning. The fear of falling down and embarrassing or hurting yourself sits deep in newer cyclist. But don’t worry. Everyone hat these thoughts and everyone overcame them easily. In this article, we will guide yours through your journey to clipless! First: Why are they called clipless if we have to clip in? In the past, people didn’t have shoes with cleats. So they raced on platform pedals. These were not steady and rider kept slipping off. Until someone put “clips” on their platform pedals to keep the foot in a good firm position. Technology evolved and the clips removed. Thats why we call our clip-in pedals “clipless”. Clipless pedals bring clear advantages, especially in terms of efficiency and control on the road bike. First of all, a safe stand on the bike is guaranteed by clipping in. This can be very helpful, especially in wet weather, as click pedals prevent you from slipping off the pedal. Thanks to clipless pedals, you can not only exert force when pedaling downwards but also take advantage of a pulling movement during the second half of the pedal rotation. More muscles are used and the movement becomes easier and at the same time more efficient. The so-called “round step” makes it easier to reach high speeds with the road bike and to keep them constant. Can I also ride without clipless pedals? In principle, there’s nothing to stop you being on the road bike without clipless pedals. Especially for beginners “normal” pedals can be a suitable solution for the first tours. If you’ve never sat on a road bike before, you can get used to the new riding experience and concentrate on other things. Of course, clipless pedals are a little impractical if you want to use your road bike as a city bike to ride to work or to the store. But if you want to use your road bike as a piece of sports equipment, it’s worth switching to click pedals sooner or later for the reasons mentioned above. For riding with clipless pedals, you first need shoes with special plates attached, the so-called “cleats”. There are two common systems. One is more often used for road bikes (cleats with three screws), the other for mountain bikes (cleats with two screws). But more about that later. First of all, it should be mentioned that both systems are suitable for road bikes. The shoes are generally clipped in and out with a spring mechanism on the pedal. The cleat engages by pushing you „toes” forward and your foot downward. You will hear a clear „click“ sound and you’re strapped in. In most cases, the cleat is released by turning the heel outwards. This can be harder or easier, depending on your „tension“, but we will talk about it later on this page. One foot should already be clicked in before riding off. During the ride, the other foot will be clicked into place. If this doesn’t work right away, keep pedaling and try again. This might take some tries, but I assure you, you will get it. See all the types of cleats. Don’t worry about it. It is easier than you think. The idea of being trapped in the pedals is often a deterrent feeling for beginners. The reassuring news: there is almost always a way out of the pedals that you can control yourself. In the event of falls or accidents, the pedals usually release themselves and you won’t be locked to your bike. It often happens to beginners that they do not release themselves out in time when stopping and then tilt to the side at a traffic light, for example. To avoid this just unclip yourself way ahead of your stop and coast along with one foot inside your pedals. It helps to practice clipping in and out as often as possible, especially in the beginning. I just drove up and down my driveway clipping in and out for 5 minutes straight. A piece of cake after that! Mountain bike pedals for road cyclists? It is often easier for beginners to clip in with mountain bike shoes. The shoes have a softer sole and a better profile than road shoes. The force needed to clip in on mountain bike pedals can be adjusted less than on road bike pedals. In addition, the smaller MTB cleats are recessed in the sole of many mountain bike shoes. This makes walking a lot easier, especially if you want to get off the bike a bit more often. 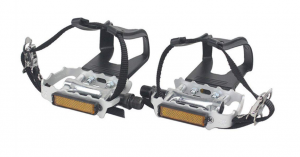 In addition, mountain bike cleats offer the possibility to use combination pedals. One side can be used with normal shoes, the other with clipless shoes. Ideal for beginners who want to have both options. It also makes it easier to use the bike as a means of transport in the city. If you use combi pedals, you also have the option to clip on them only after riding off. This is often easier because you don’t need as much balance as standing. With road bike systems such as the Shimano SPD-SL and the Look-Kéo, it is important to note that the various cleats differ in their freedom of movement, the so-called float. This has an influence on whether the foot can be moved a little in the pedal or whether there is a completely rigid bond. For beginners, it is recommended to use a large float angle first. Especially if you have not yet found your optimal foot position, greater freedom of movement can prevent knee problems and accidents. For Shimano and Look, the colors of the cleats indicate the float angle size. Also, the spring tension should not be too high at the beginning. It decides how easy or difficult it is to click your way out of the pedals. Professional models are often firmer and harder than the mid-range models. If you are not yet familiar with the clipless pedal system, you should rather choose a system with low spring tension to be able to click out easily. We also recommend clip pedals where the spring tension can be changed. With Shimano and Look this is mostly the case. Now that you know all about clipless pedals and are ready to conquer the roads see our top 5 picks for beginner road bike shoes.